The 4th of July usually marks barbeques, meeting up with family or friends, parties, and of course celebrating our independence. Each year we see more creative 4th of july looks, costumes and themed parties. 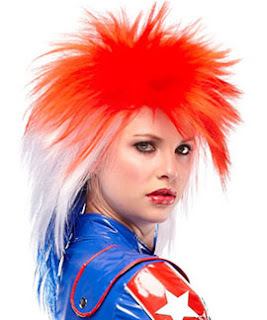 The trend to dress up in American colors is very big , therefore we have added more party and fun wigs to our collection. Complete your look with any one of our party wigs. Most of them are available in bright Reds, White, or Blue and we even have a few like the Punky American Wig below. If you love the romantic look of bangs & wavy tresses combo from Country Singer Taylor Swift, you will love the Temptress by Daisy Fuentes. The Temptress wig features Heat Friendly synthetic fiber for a more versalile wavy look (or not). More or less curls - you control it! 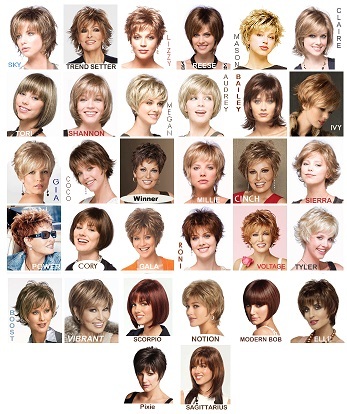 Its high quality fibers holds very well during hot and humid months making it a WigSalon top pick for the summer. This soft, feminine and romantic look will frame any face shape into a celebrity look-alike hair do. Offered in a great variety of colors, you will not want to miss it. See more celebrity summer hairstyles and matching wig styles on our look book. If a bad hair day gives you an all-day case of the grumps, you are not alone. A Tresemmé survey reported on YouBeauty.com found that one in four women would rather hide in their homes than go out on a bad hair day. Fortunately, a great hair day can put a smile on your face and send your spirits soaring. Science has begun verifying what we’ve learned from experience: How we look affects how we feel about ourselves. Because it frames the face, hair is a major factor in our assessment of our appearance. In a Yale study, self-esteem plummeted when participants recalled a bad hair day. Bad hair memories “increased social insecurity and self-criticism and lowered performance self-esteem, hurting subjects’ can-do attitude toward personal accomplishments,” Mary Rose Almasi wrote in The Psychology of Hair. On the other hand, women participating in a Harvard study experienced a drop in blood pressure signaling decreased stress after a good haircut or coloring. Good hair has a positive effect on the psyche. Appearance and self-esteem are entwined. When you look good, you feel good about yourself and that little boost of self-esteem gives you greater confidence in your abilities both at work and in the social arena. All kinds of good things can happen when your self-confidence is riding high -- and it all starts with how your hair looks in the morning! When you wear wigs from WigSalon.com every day can be a good hair day. Don’t leave the house in a funk when your locks go awry; pop on a wig, smile and take charge of your day!